Stay on track with your health goals during the most tempting time of the year! The Holiday Season is upon us which brings about presents, delicious food, holiday parties and unfortunately, sometimes weight gain. How on Earth are we supposed to stay on track when temptations are being thrown at us in every direction disguised as Bourbon, Egg Nog, sugar cookies and gingerbread houses?! The food is one piece to this puzzle. The other piece is time. The time that used to be devoted to the gym or workouts is now being spent going to office holiday parties, Ugly Christmas Sweater bar crawls and gatherings with family and friends. I have to say that October-January is the hardest time of year to stay on track with your fitness. This leads me to the question, how DO we stay fit during the Holidays? There is no magic pill you can take to undo some of the fitness damage that is done during the holiday season. It's all about the approach you decide to take. You need to know that, yes, you will eat foods that you don’t normally eat. Yes, you will drink drinks that you don’t normally drink. And, yes, you will gain weight if you do NOTHING about the previously mentioned food & drink. I’m not saying that you can't have fun and have to lock yourself inside until January. You just need to know that if you plan on attending a holiday party, you should go ahead and make sure you go to the gym either that day/morning or the next day. It’s not the one party that will throw you off track. It’s a combination of ALL the events, foods, drinks and choices that we make during the holidays that eventually combine forces into one super, duper muffin top, with a side of some love handles. One day won’t make or break you but 1-3 months of bad choices sure might do some damage. I have clients who have lost 10, 20 even 30 pounds and are truly panicking on how they will make it through their holiday travels and keep the weight off. Best advice I can give would be to know what works for YOU. If you know you can’t resist food, make sure you work out extra the days you are going to “be bad”. If you know that you won’t have the time to work out, make sure you eat a little healthier those days since you won’t be burning off as many calories. If you know you lose all motivation during the holidays, pay for a training session or sign up for a group class that makes you feel accountable and gets you into the gym. Before ANY social gathering, drink a bottle of water or a protein shake. This will give you the added protein to your diet for the day and will delay your desire to sample all the Christmas cookies in sight. If you do want a cookie or anything you wouldn’t normally eat, try breaking the cookie into smaller pieces. It plays a visual trick on the mind and usually helps delay the much feared “binging”. I ALWAYS advise staying as active/distracted/busy as possible around this time of year. We tend to eat when we are bored. If your mind is preoccupied with something else or focused on a task, you won’t be thinking about the food as much. If you are traveling, try to walk EVERYWHERE possible. And lastly, if all else fails, contact me and I will be glad to follow you around and push the Christmas cookies away for you! 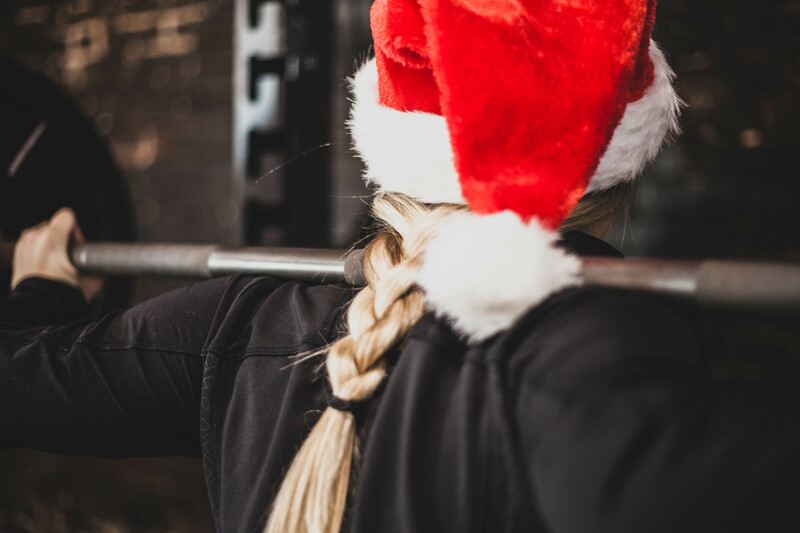 In conclusion, it is possible to indulge a little into the holiday madness if you remember your goals and never lose sight of your fitness routine. Have a happy and healthy holiday season!